Reliable measurement of flow plays an important role in maximising HVAC system efficiency and conserving energy. Inline flow sensors from Belimo utilise ultrasonic transit-time technology to provide accurate and repeatable water-flow measurement. Their compact size and insensitivity to dirt make them ideal for use with HVAC chilled water, hot water and water/glycol solutions at temperatures ranging from -20 to 120 °C. The sensors are fabricated from corrosion-resistant materials, ensuring reliable operation and extended product life. Multipoint wet calibrated to ensure accuracy and repeatability. Patented temperature and glycol compensation logic assures accuracy over the whole temperature and glycol concentration range. 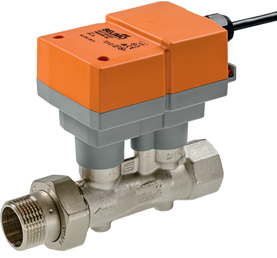 ±2% accuracy of reading and ±0.5% repeatability ensure accurate and precise flow measurement. Ultra compact size: with a short inlet length of 5 x DN and no output-length requirements, the ultra-sonic flow sensor from Belimo can be installed even where space restrictions are very tight. Low power consumption of 0.5 W saves energy and transformer capacity.